Following tutorial explains how to uninstall phpMyAdmin on Ubuntu 18.04 Server, you can also use following method on any previous Ubuntu release. We will also discuss how to enable and disable phpMyAdmin without uninstalling the phpMyAdmin package. 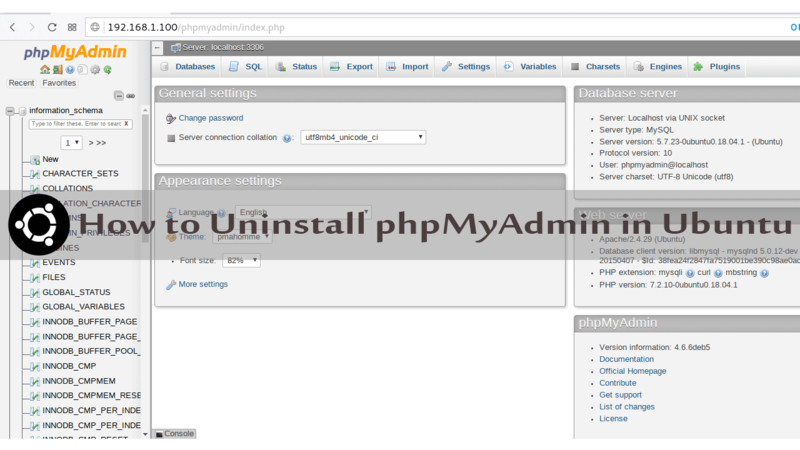 The "apt-get remove phpmyadmin" command will uninstall the phpmyadmin package, the purge command will remove configuration files related to Ubuntu phpMyAdmin and the autoremove command will uninstall all the dependency packages that are no longer required. If you just want to disable access to the phpMyadmin, you could simply disable the phpMyAdmin without uninstalling it. You can find Ubuntu Apache phpMyAdmin configuration file under the /etc/apache2/conf-available/phpmyadmin.conf.